Immunizations are probably not what you think of when you think about medical treatment. Likely it is something you associate with young babies who are young and at risk for infection. There are several medical conditions where timely immunizations are an essential part of care. People with sickle cell disease are at increased risk of infection and immunizations are a crucial part of complete sickle cell care. People with sickle cell disease start having organ damage in the first year of life. One of the first organs affected is the spleen. The spleen is a small organ on the left side of the abdomen underneath the ribcage. The spleen filters the blood and removes old and damaged red blood cells. The spleen is also an important part of our immune system. It serves two important roles in our immune system: filtering out bacteria (particularly bacteria called encapsulated bacteria) and producing lymphocytes, a white blood cell that helps to make antibodies to infections or in response to immunizations. The red blood cells have to squeeze through some very small areas in the spleen. When the red blood cells sickle in the spleen, they damage the spleen. This damage occurs repeatedly and in people with severe sickle cell disease, spleen function is lost before the age of 5. This loss of splenic function significantly increases the risk of infection. Streptococcus pneumoniae: This bacteria is a common cause of pneumonia in children and adults. Additionally, it can cause meningitis (infection of the lining of the brain), bacteremia (bacterial infection of the blood) or sepsis (blood infection that causes a major inflammatory reaction). Neisseria meningitidis: This bacteria is the number one cause of bacterial meningitis in children and young adults. It can also cause bacteremia or sepsis. Haemophilus influenzae type b: Prior to routine vaccination, this bacteria used to be the leading cause of meningitis in children. It should not be confused with the influenza virus. Influenza: Influenza is a virus that causes respiratory infections. People with sickle cell disease who develop an infection with influenza are more likely to be admitted to the hospital. Additionally, influenza infection can trigger lung complications like acute chest syndrome. Pneumococcal immunizations. These vaccines protect against Streptococcus pneumonia infection. The first series is given to all infants (2, 4, 6, and 12-15 months of age). It is called Prevnar 13 or PCV13. Children with sickle cell disease should also receive Pneumovax (or PPSV23) at 2 years of age with a second dose five years later. Meningococcal immunizations. All children are immunized against Neisseria meningitidis but children with sickle cell disease receive these immunizations earlier. There are two ways to receive the immunization: as part of routine infant vaccination (four doses at 2, 4, 6, and 12 -15 months of age), or after 7 months of age (two doses). This vaccine is called Menveo or Menactra (MCV4). This immunization requires booster shots throughout life. In 2016, immunization against meningococcus type B was added to the recommendations and can be given as a two- or three-dose series starting at age 10. Haemophilus influenzae type b. Immunization for Haemophilus is part of the routine immunizations in the first year of life (four doses). This immunization is called Hib and can be given in combination with other immunizations. Influenza. Immunization with the yearly influenza is recommended for people with sickle cell disease. Influenza vaccines can be administered yearly starting at 6 months of age. The first time someone under the age of 8 receives the influenza vaccine, two doses are required (at least four weeks apart). Afterward, only one dose is required each year. The vaccine is changed yearly so it must be given each year. It is important to know that the season for influenza runs from about October to March. If you receive your influenza vaccine in January, you would need another one after October to cover the new influenza season. 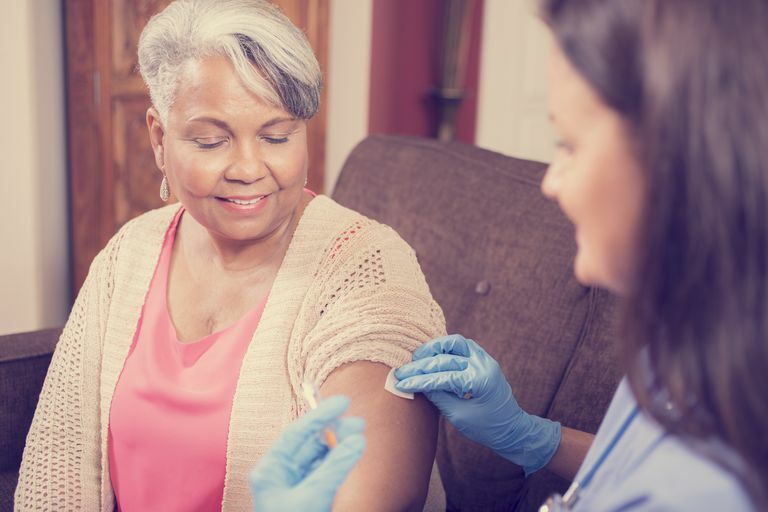 These infections sound scary, but fortunately, these immunizations have significantly decreased risk. Additionally, penicillin is given to children with sickle cell disease from birth to age 5 to prevent bacterial infections. If you have questions or concerns about these immunizations, please discuss them with your physician. Field JJ, Vichinsky EP and DeBaun MR. Overview of the management and prognosis of sickle cell disease. In: UpToDate, Post TW (Ed), UpToDate, Waltham, WA.